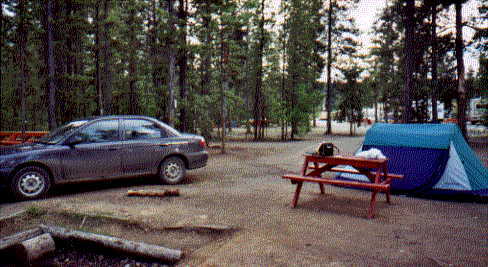 Arrived at Watson Lake in the Yukon! Drove about 630 miles today. Fantastic scenery! Mucho Lake is a beatiful green. Almost stopped there to camp. Took a break at 11 AM for coffee and a sandwich. Bought & sent postcards. Got more to write, but there are too many mosquitoes outside the tent. They are big, fast, and hungry. 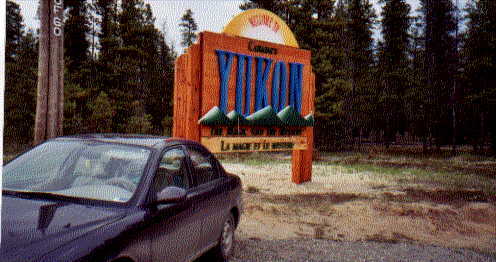 I'm in the Yukon! I can't believe it! Still got a long way to go to Fairbanks. 9:30 PM and still light out. They say the sun starts rising here at 2:30 AM. I wonder what time it sets. By the time I reach Fairbanks, it won't set at all. It's not cold, but I've got plenty of the blankets that I bought as gifts in Mexico. They'll just be a little used when I give them away. 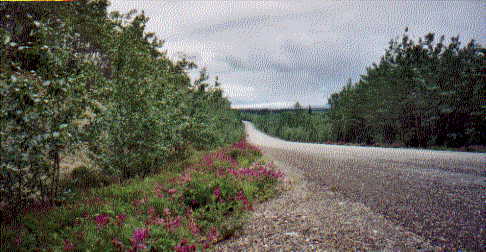 Above: Flowers along the Alaska highway in the Yukon. Saw a brown bear today and a fox. Saw 4 black bear yesterday. They say tbe brown bear are grizzles. Hope I taped all the holes in my tent--don't want the mosquitos getting me. Birds are still chirping. It would be nice to get a good 6 or 7 hours sleep. Beginning to feel like a zombie! Above: Signpost Forest. People bring signs from all over the country and world to display here Watson Lake.